Axis EN Fire Panels are Advanced’s highest performance EN54 approved panel range and is fully compliant with parts 2, 4 and 13. 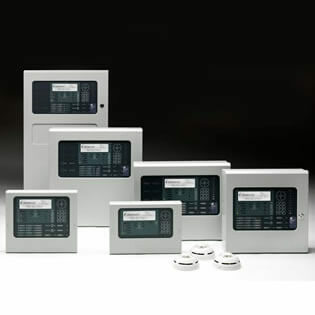 It is the result of decades of fire alarm and detection experience and research and development involving installers, specifiers, consultants and end users across the world. Axis EN panels have been designed to offer more power and performance in a user-friendly enclosure. Axis EN packs more configuration, display, status and control options into its interface as standard than any other Advanced fire panel, which means less time and expense customising a system with peripherals. Axis EN’s processing power and advanced component design means it delivers more features, an advantage it will maintain for years to come. Every Axis EN panel features Advanced’s unbeatable networking capabilities and Dynamix Tools fire panel software making it is easy to use and configure, from the smallest to the largest of sites and with complicated cause-and effect. 20 programmable zonal / 25 System LEDs. Advanced graphical LCD user interface and support for up to 200 fire zones by default allowing full EN54 compliance without additional hardware. Dedicated USB & RS232 Serial Port for direct PC or modem connection. Installer friendly Auto-learn, Loop Detection and On-board Scope facility. Graphical display configurable for virtually any language. Robust removable equipment chassis with plug-in connectors for simple fixing and cable termination. Integral P-Bus for system expansion via available option cards. Dual flash-based microprocessor technology with real-time clock on-board. Installer friendly Auto-learn, Loop Detection and On-board Scope facilities for ease of commissioning and fault finding. Fully programmable via the on-board alphanumeric keypad, or PC configuration tools. Installer friendly Auto-learn, Loop Detection and On-board Scope facility for ease of commissioning and fault finding. The graphical display can be configured to operate with virtually any language or character set, and allow the installer’s logo to be applied using the Logo application software. Approved to BS EN54 part 2, 4 and 13. Fully expandable from 2 – 8 loops via plug-in loop driver boards. 20 programmable Zonal / 25 System LEDs with slide-in labels. Dedicated loop driver for Apollo or Hochiki protocol support. 2 x 5 Amp power supply and charger to En54 part 4. Ad-NeT peer-to-peer network with up to 2000 zones. The remote terminals utilise the same graphical LCD user interface that can be found on the Axis EN series fire panels and are based upon the same advanced, flash based, microprocessor technology. All remote terminals incorporate buzzer mute, view, enable/disable and test facilities with dedicated system and navigation keys for simple user control. − MX-5030 – Remote Control Terminal with additional LED status indication, four programmable push buttons, Mute, Silence, Reset, Resound, Lamp Test and Evacuate Keys. The Fire Safety Search website is an ever growing community of international fire safety professionals including distributors and end users looking to source the latest fire detection equipment and keep up to date with the latest fire protection industry developments.